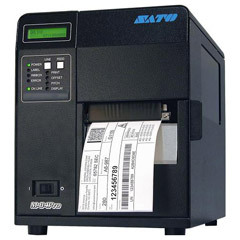 The new SATO M84PRO is the latest printer in the PRO series, for your demanding industrial needs. Known for its durability, the M84PRO is an upgraded version of the M-8400RVe and is a new generation of high-resolution printers that print images with a resolution of up to 609 dots per inch (dpi). The 305 dpi version is also an excellent replacement for the M-8450 with its higher throughput speed. M84PRO also features an "automatic detection system" that will help you to identify which printhead is being installed in the printer, which in turn, helps to accomplish print resolution selection easily: 203 dpi, 305 dpi or 609 dpi. It also has the ability to easily and efficiently produce labels directly from software such as Word, Excel and Access and also from the label design software Label Gallery.